Judy and Don(Wirth) have been trying to get PB started in Naples and it looks like they are having success. Two of the new players are Racquetball Players and have picked up PB very quickly. It is so great to see how folks from our group are bringing others to the Game; we have John Fitzgerald working in the Florida Panhandle too! 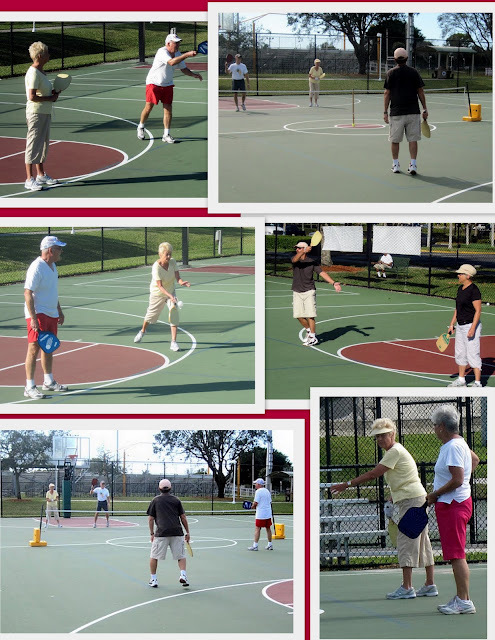 Don and Judy started playing pickleball in Franklin, NC , during the summer and fall, but decided to get something going in Naples, where they spend their winters. They are currently playing on basketball courts lined for pickleball by the Community Center att Fleischman Park. Judy says: "We have been working 3 years and are finally getting enough people to have one court on Tues, and Thurs and sometimes Sat. We have 2 courts available. The community center furnishes the equipment, although some of us have our own paddles. It is open to anyone who wants to come and play--free! Below is a recent group photo. We understand that the night before this picture they were enjoying the sunset on the beach! Pickleball players do have fun!! Don and Judy have taken the next step - they will be competing in the Collier County (Naples) Tournament on February 11th and 12th. We wish them luck! !